Workers’ Compensation and Medical Payments – ACT NOW! Over the summer, Governor Rauner vetoed SB 904 (Hastings/Hoffman), which would have provided a way to enforce interest on late payments from insurance companies to medical providers under the workers’ compensation system. The legislature returns to Springfield next week for the fall veto session. Therefore, we are asking our members to contact their legislators and ask them to SUPPORT action to override the veto of SB 904. If this action is successful, it means that the bill would go into effect in its original form. As reported previously, the General Assembly passed legislation in the Spring to address workers compensation insurers’ frequent payment delays and failure to pay interest as required by the Workers’ Compensation Act. When the bill reached the Governor’s desk, he vetoed it and made changes that did not benefit health care providers. Medical professionals deserved to be paid in a timely manner for the services they have provided to their patients. Payments are being significantly delayed by the insurance companies until claims have been resolved at the Workers’ Compensation Commission. This can be a very lengthy process, which leaves the medical professional without any payment for long periods of time. The ability to collect interest allows medical professionals to obtain some compensation for the delay in payment for the services they have provided. The Workers’ Compensation Act already provides for interest payments, but this action will correct a court case that ruled that medical providers have no means to enforce interest. The Governors’ changes have the potential to cause further delays in payments to medical providers. To learn more about the legislation and its specifics go to www.ilchiro.org/speakup. We also provide the tips and tools for you on how to make contact with a legislator, approach a legislator, write letters, and understanding who the officials. Nervous about meeting your legislator? Listen to Dr. Paunicka talk about how easy it is! Use the American Chiropractic Society's Legislative Action Center to find your State Representative's contact information. 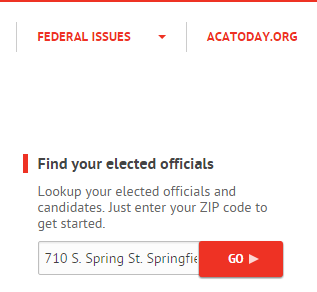 Enter your entire address in the "Find Your Elected Officials" field on the right and click Go (example). 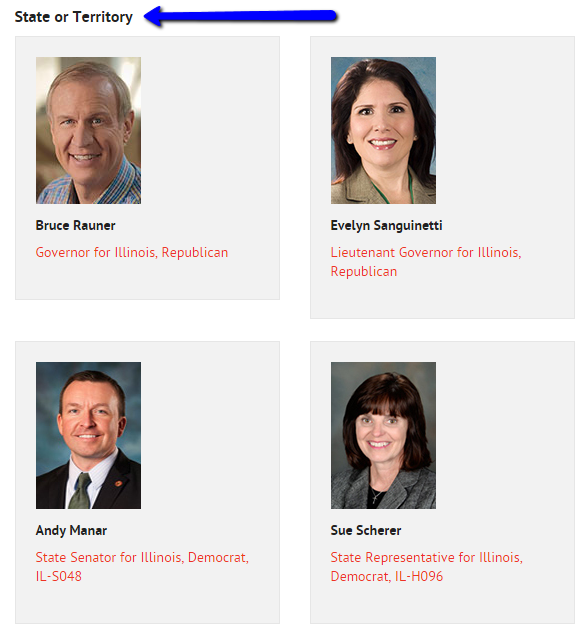 Your State Representative will be towards the bottom of the resulting page (example). Click on his or her picture to find the Springfield Office phone number.